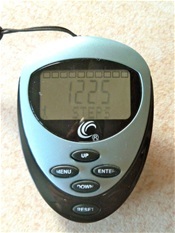 To be fair (can you be fair to a pedometer?) it has been languishing at the very back of a drawer for the past three years so it's a wonder it operates at all. Perhaps I should invest in another, more truthful and hopefully far more supportive model. All this is because I have resolved to be more active in retirement, to become super fit and healthy with it. To date, my exercise regime is somewhat gentle - walking (slowly), swimming (extremely slowly) and aqua-aerobics sessions (very much at my own slow pace.) I am researching other classes on offer at the health club by studying the people who come into the cafe bar after a session. Any class which leaves most of its participants pink of face and short of breath is probably not for me. Unfortunately this does seem to discount most of the classes on the schedule. Mr B points out that generally exercise classes are supposed to tax and test you and suggests that perhaps I am using the wrong criteria. Well, I may indeed be using the wrong criteria - but at least they are MY criteria! Driving to my aqua session this morning I was listening to Alistair Campbell discussing the publication of his diaries with Libby Purves. Why did he always sound so angry in his diary entries? Libby asked him. The answer, according to Alistair Campbell, was that this was a feature of his somewhat depressive personality which meant that every evening he would dump all the frustrations of the day's events onto the pages of his journal. It made me feel pleased to be a Pollyanna, however unfashionable that may be these days - just think what a miserable read the Daily Blog would be otherwise!